Any list of classic El Paso restaurants would have to include Su Casa, a neighborhood hangout that has been operating at the same place for longer than I can remember. 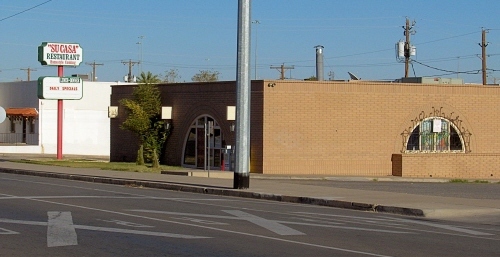 A friend reminded me that Arnold’s, another classic El Paso eatery, was at this location before Su Casa opened. While Arnold’s may have already established the popularity of the location, Su Casa has kept people coming back even if their residences or jobs have since moved out of the neighborhood. Having a central meeting place is part of the reason, but people have a hard time finding the same food anywhere else. Su Casa seems to have escaped the notice of most tourists, but the restaurant is already so crowded for lunch I doubt that one of the priorities of the owners is to advertise in the local travel guides to attract new customers. Instead, word of mouth seems to bring most people who are not already regular customers. I have a hard time choosing any one Mexican restaurant that I would advise out of town travelers to visit if they have only one meal in El Paso, but Su Casa is certainly one that would be on the short list. The food here typifies the classic El Paso style of Mexican food, and is of consistently good quality no matter what you order from the menu. The combination plates are good at Su Casa, as are many of the single item plates. 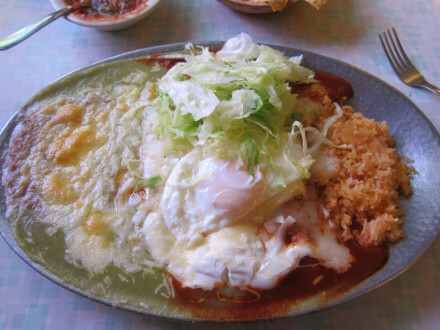 For me one of the best tests of El Paso style Mexican food is the Red Enchilada, and the one at Su Casa is certainly one of the best (this is the opinion of myself as well as several of my friends). The one here has a good spiciness, and the cheese provides quite a good flavor. It can sometimes be skimpy on the sauce, but if you need more sauce you can ask for it. These are an El Paso variation of the New Mexico style enchiladas, which are generally slightly more spicy than their borderland cousins. The deep red color with the accompanying flavor, though, is something they have in common. Every day there is a plate served as a special, and I think this is a good deal provided it includes a red enchilada (and I think most of them do). One example is the Combination No. 2 which includes a beef taco, rice, chile relleno, red enchilada, and beans. This might be nick-named the “classic” plate because it includes all the classic El Paso dishes on one plate. The Beef Tacos are among the most enjoyable anywhere, made with ground beef and topped with Mexican cheese. They are not spicy, though, which is why I like to get them in combination with other items. What is really noticeable here is the way they are cooked so that they are neither too hard nor too greasy. The Chile Relleno is served with a fairly mild sauce and a very doughy crust that distinguishes it from the New Mexico version. The chile itself and the cheese inside, though, are very similar to ones I have had in Las Cruces and other places throughout the Land of Enchantment. I was especially impressed by the way the cheese melts to just the right consistency for maximum enjoyment of this dish. 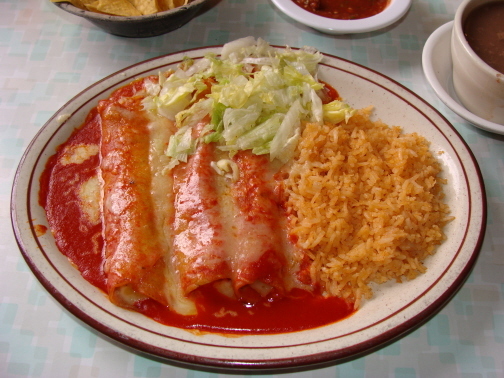 Tri-Color Enchiladas are another good choice for a combination plate, and provide more classic El Paso style dishes. Known as the “Mexican Flag” in some restaurants, the red, green, and white represent the colors of the flag, but also give a variety of flavors. I think the green chile at Su Casa is one of the best in El Paso, although the red is really my go-to choice. The “white” enchilada is actually a red one with sour cream on top, so you are in effect getting two red enchiladas and one green one. They tend to spread the sour cream over all three enchiladas on the plate, but you do end up with the three distinct flavors. 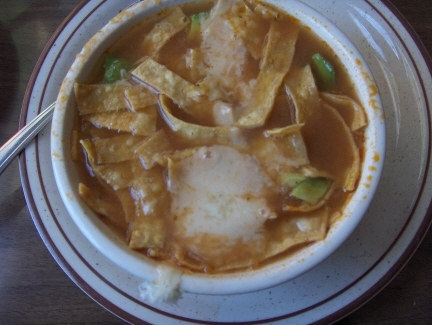 The Tortilla Soup is well spiced with excellent cheese. If this were going to be the main part of the meal, though, I would prefer the caldo tlalpeño at Café Mayapán that also contains avocado and a whole chipotle chile. Su Casa serves the soup in either a whole order, which would constitute a pretty substantial meal, or a half order. The Refried Beans, topped with a generous amount of cheese, are delicious when eaten on chips. Traditional wisdom seems to be that beans made with lard have a better flavor, but the ones at Su Casa made with vegetable oil seem to disprove this theory. I think Su Casa should be known as much for its Middle Eastern food as for the Mexican menu. The Spinach Pies, made from scratch in the owner’s home, have the best flavor I have tasted anywhere, but suffer from the fact that they are kept frozen and then microwaved when you order them. The ones here are probably not like you would find in Lebanon, but they are better than the ones I have tried in the city’s Middle Eastern restaurants. Even though the crust shows some signs of being microwaved, the inside filling is fresh and moist, with a rich Middle Eastern flavor. For me, this is one of the best lunch plates served at Su Casa. 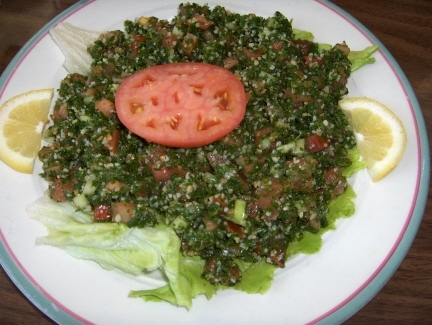 The Tabouli is made fresh, and has a well deserved reputation as one of Su Casa’s most popular dishes. The light sauce brings out the true flavor of the vegetables that I find typical of good quality Middle Eastern food. My respect for the tabouli at Su Casa has increased over the years as I have tried other versions in El Paso and other cities that seemed too have to much or too little of certain ingredients, while the one at Su Casa has just the right balance of its various components. Lebanese food is a real passion of the owners, and it definitely shows in the tabouli and other dishes that are served. 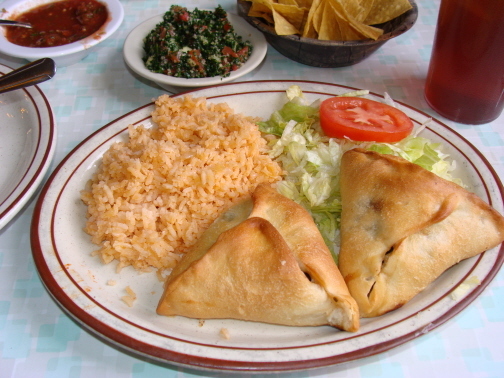 Several other Lebanese dishes are offered including kebby, Middle Eastern style chicken, and shish-kabob. The Salsa is not the spiciest in El Paso, but may have the freshest ingredients. The owners’ Middle Eastern heritage comes through a little bit in the mixture of ingredients that come together to provide one of the most complex flavors of any salsa in the city. 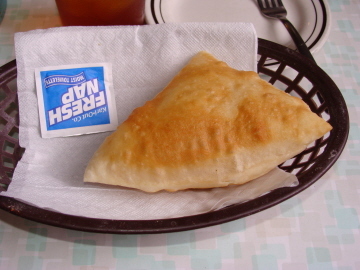 Complimentary Sopaipillas are served after every meal, and are some of the tastiest around. This one, like many served in El Paso, are thinner than the New Mexico version. Almost everyone who is a regular will say that one of the attractions is the excellent service. Su Casa is a neighborhood, family style restaurant, and once you go you will likely be remembered from then on. There is a higher likelihood of running into my friends here than at any other restaurant in the city. Everything seems to come together to make it feel like “your home” (su casa). Hours: Lunch only Mon.-Sat. (open until 7 pm on Fri.); closed Sun.